This is a handy recipe to have up your sleeve for midweek meals. 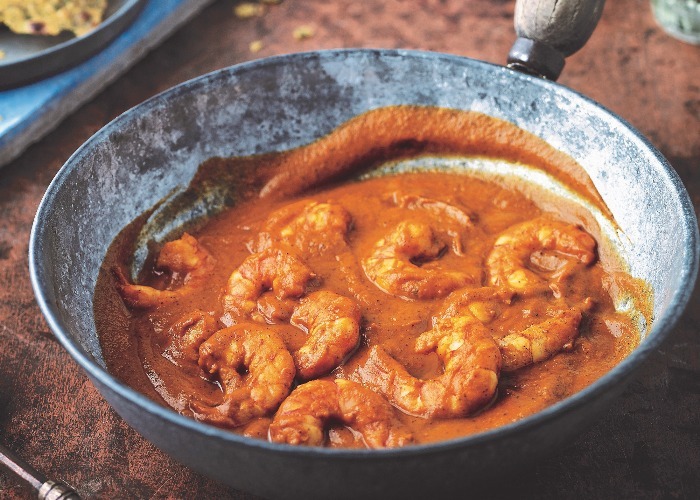 It is easy and relatively quick to prepare, and the prawns can be replaced with any white fish that’s available – the spice blend works well with the flavours of seafood. The key to success is to simmer the sauce slowly which creates depth of flavour. Serve with chapatti or rice. Heat the oil in a medium saucepan over medium–low heat. When the oil is smoking hot, add the mustard seeds and cook for 1–2 minutes, until they begin to sizzle. Stir in the onion and cook for 10 minutes, until golden. Mix the garlic and ginger into the saucepan and cook for 2 minutes, until they begin to take on a little colour. Pour in the canned tomatoes, mix well, then cover the pan with a lid, reduce the heat to low and simmer for a good 15 minutes, until the oil has begun to separate from the sauce in little pools around the edge of the pan. Take the pan off the heat and use a hand-held blender to whizz the sauce until smooth. Alternatively, purée it using a blender, then pour it back into the saucepan. Return the pan to the hob over low heat, cover with a lid and cook for 10 minutes, until you have a richly flavoured and thick sauce. Stir the salt and the remaining spices into the saucepan, then throw in the prawns and mix carefully. Cook for 4–5 minutes, until the prawns have turned pink. Stir in the cream and cook for 1 minute, then serve immediately. This recipe is from Chetna’s Healthy Indian by Chetna Makan. Published by Mitchell Beazley. Photography by Nassima Rothacker.